At the end of every year, the panicked search for the next big social media platform begins. Brands look for something that might capture the consumer’s imagination as much as Facebook, Twitter or Snapchat. At WGSN we forecast two years ahead, looking at what people are downloading, testing out and sharing with their friends. At the end of the day, no matter how fancy the design, if the new site or app doesn’t have a human, social connection, if it isn’t sharable or fulfilling a need (and sometimes that need is just to have more fun or to be entertained) it won’t resonate with consumers or act as a useful platform for brands. For our New Social Worlds report (paywall), we’ve highlighted the top 10 social networks to watch. Here’s a teaser of the social worlds that should be on your radar. 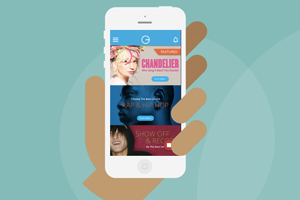 This app is reinventing music talent shows for the mobile and digital first generation. It’s the perfect formula, giving new talent a stage and wannabe Simon Cowell’s a chance to play judge, by uploading their armchair critiques. Vloggers have never been so popular, and this might be where you find the next Zoella of music. The last few years have been about apps that erase your past mistakes, such as texts sent after a few glasses of wine. Incubate is the opposite of that, it lets you plan text messages into the future- to celebrate milestones like a birthday or wedding. Event brands should download this one, the format is ideal for them as consumers plan for big days and will be looking for gifts, products or experiences to mark the occasion. The new status update is a song, well according to OneSong anyway. This app invites users to create a profile and then pick one track that sums up how they are feeling in that moment. Each user and their song then form part of a playlist like an organic, impromptu digital mixtape – created by the Onesong community. It’s a very timely app, since mood, emotion and feelings continue to influence retail markets. Glade just launched its Museum of Feelings and companies like Coca-Cola are already experimenting with emotional analysis software. One Song currently links to Spotify premium, so offers great opportunity for music related brands. This is the first social network created by Londoners, for them. Localisation is its USP, and makes it stand out in the sea of apps available in the Apple store. This personalised, curated content for its users is very of the moment. Apps like Snapchat have seen the importance of offering a local city button, and big data is proving the importance of personalisation for customers- to create a stronger, closer relationship with consumers.